Office 365: Not sure if your vanity domain is being used by another Office 365 tenant? Don’t worry. I remember not long ago, the pain of trying to find out in which Office 365 tenant your vanity domain was validated, when you bumped into the error stating that the domain was in use, while adding it to your current tenant. This was maybe because I work with multiple tenants and I recycle my tenants quite often, for testing purposes, but I’ve also seen it with others while trying to assist them in their migration projects. As you can see above, it will tell you exactly in which tenant the domain is, just so you can login to it and remove it. So remember to add the DNS record first and click “Verify”, Microsoft will either add the domain or explain exactly why they can’t, which I am sure it was for a long time one of the main asks of Office 365 admins and consultants. UPDATE: See this link for the updated version of this blog post. The script above is a very simple script that will read from the CSV. Before you run the script make sure you import the Active Directory module, as described on step 1, into your PowerShell session. It’s very common to see Office 365 administrators asking in the community “How can I get a detailed report of the licenses i have assigned on Office 365? Well it will depend on how detailed you want the report. I’ll detail here two solutions. The above command lists ALL users and not just the ones that have a license. See the output CSV file below. There are ways of filtering the output (i.e export only licensed users), but i will keep this post simple. Let me know if you need something more elaborated. One of the other requirements, is to know in detail, how many licenses per product do you have enabled, and which users have that license. 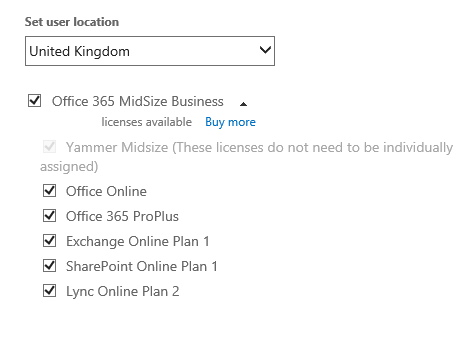 If you want a detailed list with the users that have Lync Online, Exchange Online, Office Pro Plus (just to give three examples), or any other product that you have on your subscription, enabled or disabled, all you need to do is use the “Export a Licence reconciliation report from Office 365 using Powershell” script available on the Microsoft Gallery. 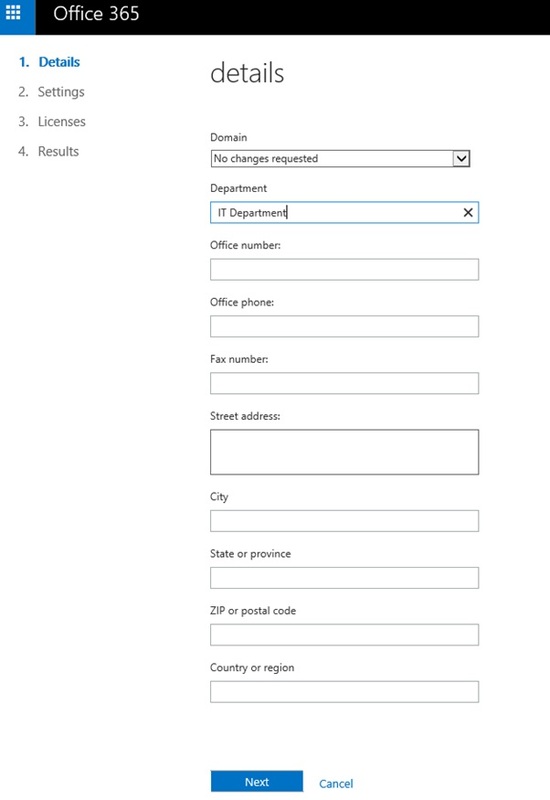 Again to run this report you need to open the Windows Azure Active Directory Module for Windows Powershell, and connect to Office 365. Once connected to Office 365 browse into the directory where you saved the script, and run it. The script will prompt you for the Office 365 administrator credentials, and run against all licensed users. By default the script creates a file named “Office_365_Licenses.csv” that will be created on the same directory where the script is. If you want, you can change it by editing the script. There’s also some other things you can change on the script, such as export all users and not just the licensed users, or use the existing credentials cached on your powershell session, instead of prompting you for credentials each time you run it. But again I will keep it simple for now, and if you want to change something on how the script works, let me know. Now let’s have a look at the detailed output of the script. Let’s now take the user Antonio Vargas as an example. He has all licenses assigned. Let’s see the view from the portal. 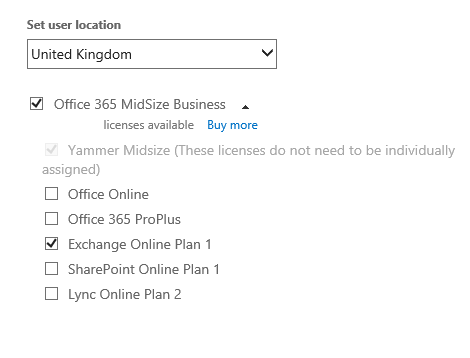 As you can see the Yammer licenses are assigned by default (hence the “PendingInput” state on the property exported to csv), and all other licenses are assigned, which matches with the success property on the csv. Now below let’s have a look at the user Calvin, which only has the Exchange Online license enabled (and the Yammer by default). All the other licenses are disabled. 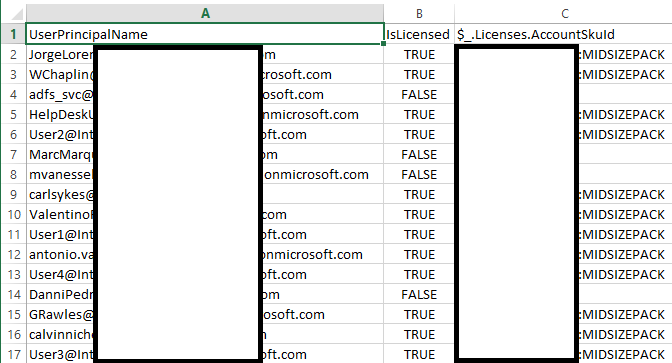 Again when looking to the licenses that the user Calvin has assigned, via the Office 365 portal, it matches the csv file. If you want, and because usually the output you will get is a very large csv file, you can use filtering at the csv level to get smaller lists depending on the license type you want the report on. Role based access control is the permissions model used in Microsoft Exchange 2013. Probably many of you are used to apply RBAC on your Exchange on-premises, based on custom scopes. 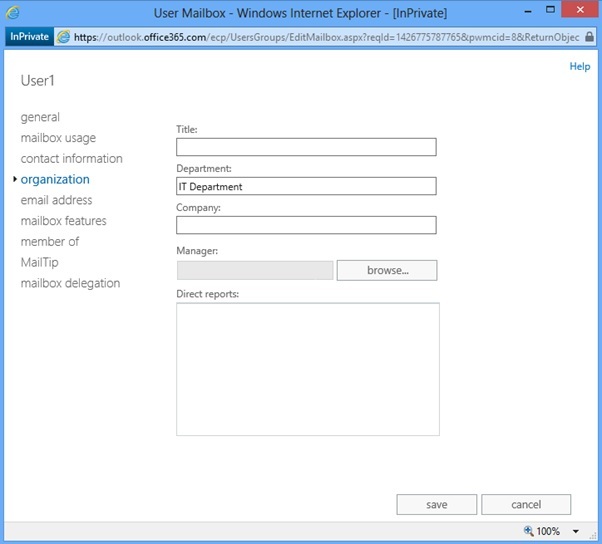 Give permissions to specific Help Desk administrators to manage only recipients that have the Department mailbox attribute set to “IT Department”. The administrators added to that role group should not be able to manage any other users. Note: RBAC customization is not available on all Office 365 plans. To make sure that your plan has RBAC customization see the Exchange Online Service Description. So let’s get started. The first thing I did was to create 4 users on my Office 365 environment, named User1, User2, User3 and User4. Those 4 users work on the IT department. I also created a user called HelpDeskUser. I want Helpdesk user to be able to manage only the users on the IT Department, in this case User1, User2, User3 and User4. The HelpDesk user is not a member of any other Role Group. All the users have a license assigned and a mailbox on Office 365. After the user creation I needed to populate the Department attribute on User1 to User4 mailboxes, because that’s the attribute i am going to use on the custom recipient write scope. You can do this in two ways, via the Office 365 Admin Portal or via the Windows Azure Active Directory Module for Windows Powershell. To do it via the portal, you need to click on “Users > Active Users”, select all the users you want to add the attribute to (you can filter before selecting), and click on “Edit”. On the Details page populate the Department attribute, as shown above, and click “Next”. If there’s nothing else you want to change, click “Next” on the other pages and click “Submit” on the last one. In the cmdlet above I’ve filtered all users with a Userprincipalname that starts with User. You need to adjust the filtering to your specific case. Above you can see the output of all the cmdlets. Once the attribute is defined on all users, we can start configuring RBAC on Exchange Online. To create both you need to open a powershell and connect it to Exchange Online. As you can see above, I only have the custom role groups and i have no Management Scopes created. With the command above i created a management scope named “HepDesk for IT Users” with a recipient restriction filter for all users with the “IT Department” value on the “Department” attribute. Note: To create a new management scope you might need to run the Enable-OrganizationCustomization cmdlet first. If you don’t you might get an error, as shown below. The command above will create a role group named “HelpDesk IT Department”, with 4 roles that will allow it’s members to manage mailboxes and distribution groups, add the “HelpDeskUser” as a member of the group, assign the previously created management scope to the group, and make it managed by the members of the “Organization Management” role group. For more information on which roles you should assign to your role group, click here. On the Exchange Online Admin Center you can see the new role group, and if you select it, on the right pane you can see the roles, members and write scope assigned to it. But, lets do some testing, shall we? Try and edit the Organization properties of a mailbox outside of the scope. You should see that the properties are grayed out, which means that the settings applied correctly and you can’t change it. Now let’s try and edit the Organization properties of a mailbox from the IT Department. You should see the properties available for editing. So the Role Group is configured correctly. When you’re migrating to Office 365 using a tool like MigrationWiz, one of the requirements should be to have a “MigrationWizAdmin” account, on Office 365, that will have full access to all the mailboxes (unless you want to specify each user’s password when importing the users to the MigrationWiz project). The cmdlet above filters all user mailboxes, excludes the one that has the Alias “Admin”, and assigns full permissions to the migrationwizadmin user. If you’re moving a subset of users to an existing tenant (i.e on a company acquisition), giving full permissions to the MigrationWizAdmin on all online mailboxes might just not be an option. Why should you give full access permissions on an existing Office 365 mailbox that is not going to be migrated? You should have a plan B.
Filtering might be a good option, but you need to set specific and unique attributes on the Office 365 mailboxes that are going to be migrated, and in most cases that just doesn’t happen. So what could be your plan B? Well if you’re familiar with the MigrationWiz process, you know that after creating the project, the next step would be adding the users/items. You have several options to add them, such as using autodiscover, bulk add users via a CSV file or manually add each user. I normally use the CSV file. To download it you have to choose the “Add > Bulk Add” option on the project, and click on “Download sample CSV file”. Then all you have to do is, export the e-mail addresses from your source system, copy them into the MigrationWiz CSV and import the CSV via the portal. Now, can i use that CSV file to assign permissions to the Office 365 mailboxes? Yes, and by using the CSV file you will be assigning permissions only to the users you’re going to migrate. I’ve built a small and simple script that will read the “Destination Email” column and assign permissions to all the users on the CSV. You can copy and paste the script into a notepad and save it as a “.ps1” script. You need to connect to the Exchange Online management shell to run the script. Click here for guidance. write-host "Permissions added for the mailbox:" $user. 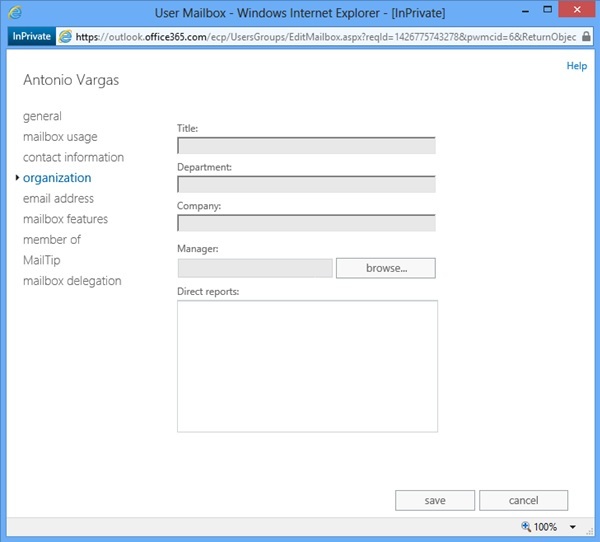 "Destination Email"
Replace the user “antonio.vargas@yourtenant.onmicrosoft.com” with your Office 365 admin MigrationWiz admin user. Note: The Office 365 MigrationWiz admin user, that will have full access on the destination, to all mailboxes being migrated, needs to be mailbox enabled. Now see below an example of the CSV file, and the output of the script based on that file. This blog post and the script can be useful to things as simple as giving permissions on mailboxes (on premises or on Office 365) based on a CSV file, or more specific such as during a MigrationWiz project. Imagine this scenario: You are doing a migration to Office 365, with Microsoft Dirsync, but you’re not the one preparing the on premises Active Directory. Someone else is doing that work and dedicated to the local AD. You tell them that all users to be activated on Office 365 need to have a vanity domain as their User Principal Name (e.g yourcompany.com). They prepare the Active Directory, you install and configure Dirsync and you do the initial sync. Now you want to make sure that no user got the username user1@yourcompany.onmicrosoft.com due to an invalid configuration on premises. Note: If the UPN of the user on premises has a domain that is not validated on Office 365, the username on 365 will be the @yourcompany.onmicrosoft.com. On the .csv file you will probably see users like the tenant admin, or service accounts. The tenant admin is a cloud user and doesn’t need to have the username fixed on the on premises Active Directory. The service accounts might be irrelevant also, and to prevent them from showing on Office 365 your solution would be to use OU based filtering on Dirsync. See here how. All you have to do now is send the .csv file to your Active Directory administrators and have them validate the users that need fixing, the users you can/should filter to exclude from being synced to 365, and the users you can ignore and keep them with an *onmicrosoft.com username. Again this is particularly useful when you’re not the one preparing the Active Directory for your Office 365 deployment.